We’re thrilled to have our first asset on the store – it is called Show Lasers and can be used to create laser shows (and other laser-related stuff). Find out more on our Show Lasers page, or go directly to the Asset Store Page for Show Lasers to buy! Seasons greetings from all of us at Sourcenity! While we are hard at work on our upcoming game PowerBeatsVR, you should take advantage of 20% off during the holidays for our two Escape The Room games on Steam! Escape the Basement (https://store.steampowered.com/…/552…/EscapeVR_The_Basement/) or Escape Above The Clouds (https://store.steampowered.com/…/EscapeVR_Trapped_Above_th…/). Or, you know, both! Check out this great article about PowerBeatsVR in VR Fitness Insider! We are happy to share new content for PowerBeatsVR with you. Three completely distinct environments and a set of great weapons for you to use – stay tuned for more! Good news for all players! 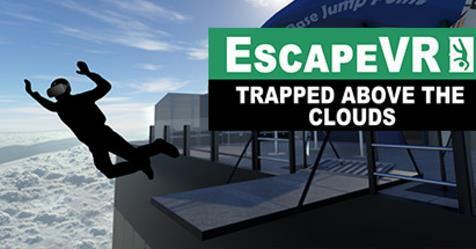 Our two escape the room games EscapeVR: The Basement and EscapeVR: Trapped above the Clouds are now available on all VR arcades powered by SynthesisVR. 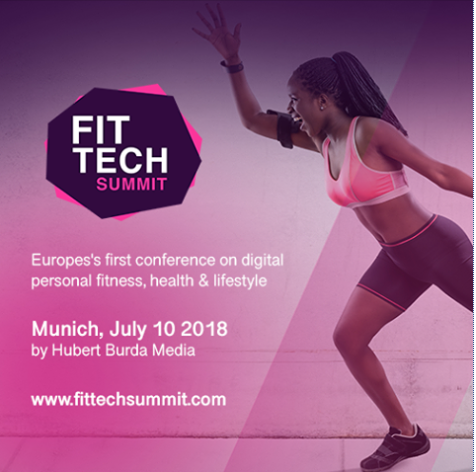 Sourcenity will be presenting PowerBeatsVR, the upcoming fitness-in-virtual-reality game with optional EMS suit support, at the FitTech Summit in Munich, Germany. You’ll have a chance to try out the game yourself: we’ll be demoing it on the Activity stage adjacent to our booth (number 17). Drop by if you get the chance! More information on our EscapeVR web site! 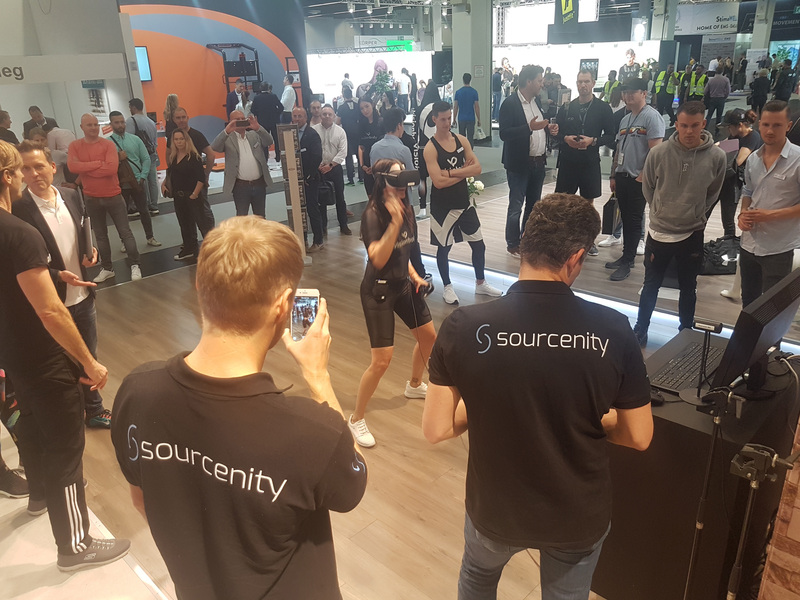 Find out what our CEO has to say about PowerBeatsVR, the integration of fitness and VR, and about the ability to add an EMS suit to the experience! 1. Don’t rely on wireless. We’ve been using the TPCast wireless sender/receiver for the Rift with great success in our office; the above mixed reality video has been created with it. However, we had trouble setting it up at the fair; while we have been able to get it to work the connection was very unstable. 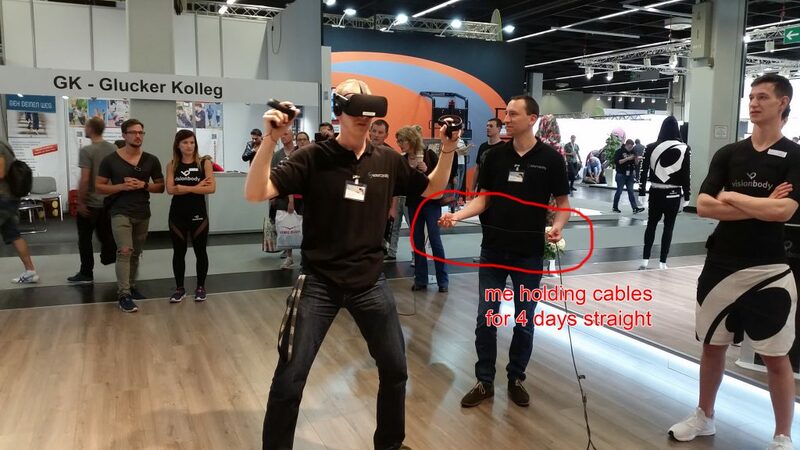 TPCast uses a WiFi connection for talking to the headset, and we believe that this was the main culprit as WiFi at fairs is an issue in general, and at our location specifically there were about 60 different WiFi SSIDs to be found. We ended up NOT using the TPCast at all but the normal cable (with 3 meters extension for both HDMI and USB), with one of us holding the cable for the player. We forgot to bring a boom, so we can’t tell you whether this would have improved things. The connection between the PC and the EMS system was another main headache for us, as it was based on Bluetooth which suffers from the same issue as WiFi on fairs, although to a lesser extent. We ended up changing the way the Bluetooth devices were linked, using direct connections and frequent checks. 2. Don’t use disposable headset covers. Second, we used disposable headset covers to prevent sweat from getting onto the headset itself, and if it did, to at least have a minimal hygiene layer for the next players. We used relatively thin, white covers which are pulled over the ears before putting on the headset. While this did work, it was a terrible user experience; putting on the headset such that the disposable cover stays in place is very difficult and players had to be helped a lot. Now, there are also non-disposable covers around which are made of faux leather or other types of plastic and which can be cleaned with alcohol in-between sessions. We really recommend going with such a cover instead of the disposable ones. 3. Use a big screen and a second in-game camera with greater FOV. 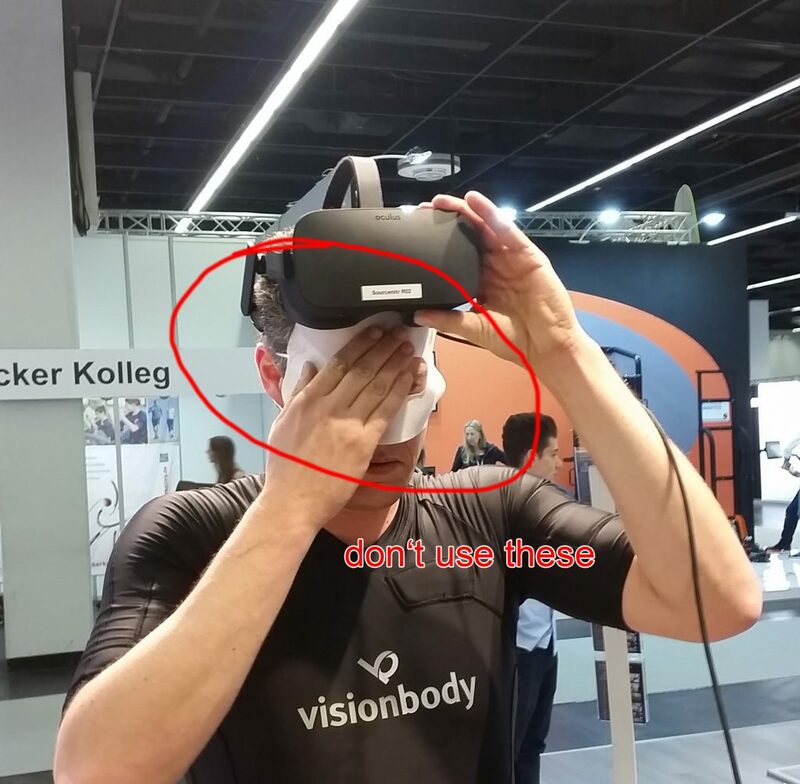 Demoing VR to the person using the headset is great for them; but the rest of the crowd feels left out if they don’t see anything. 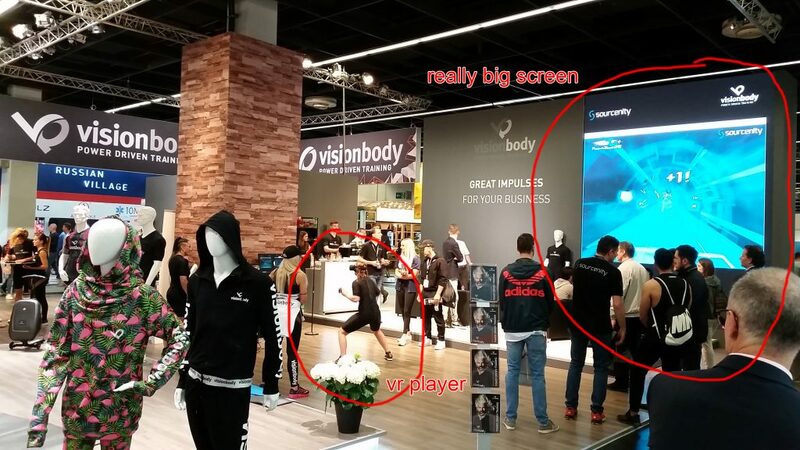 There are two things we did which helped greatly with respect to this problem: First, we had a really big screen (a video wall, actually) where the in-game video (and in-between sessions the above mixed reality video) could be seen. 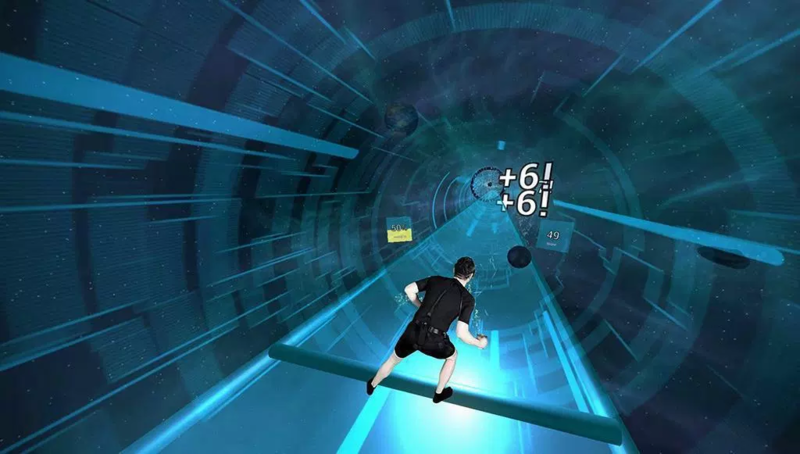 Second, we did not directly show the in-game camera attached to the headset, but added a second in-game camera which has a greater FOV and is placed a bit behind the player, mirroring his/her movements. This has the advantage that the crowd can better appreciate what the player is seeing (and, by the way, allows showing logos as well). 4. Make sure there is always someone playing. One thing we quickly learned is that nothing draws the attention of the crowd like another person already playing. So, make sure that you either have a continuous stream of visitors playing the game, or have a member of the team player the game while no visitor is there. Don’t just stand around and wait for something to happen! The final issue caught us by surprise. We brought a fairly powerful PC to the fair which in general is completely capable of running the game, however, we experienced weird crashes of our game and had to reboot a couple of times on the first day. 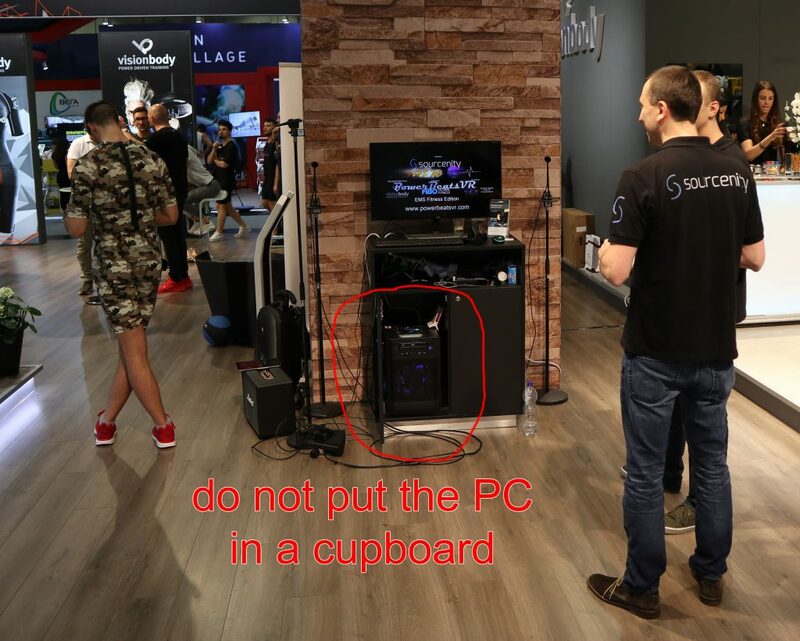 We finally realized that placing the PC inside a closed cupboard with only a small cable outlet was leading to heat problems inside the PC, and in fact both CPU and GPU had clocked down to save themselves from heat damage. We finally placed the PC outside of the cupboard which solved the issue; however we then needed to take care of all the cables both for reasons of user safety as well as appearance. So, we recommend thinking about PC placement beforehand and come up with some proper cable management. All in all, it was a great experience nevertheless and we hope you will find the above tips helpful!